These are best. The stuff and material are awesome. Like the color as well. Also they dont allow sunlight to pass. Adorn your home with the elegant luster of this Madison Park Yvette solid velvet curtain panel. 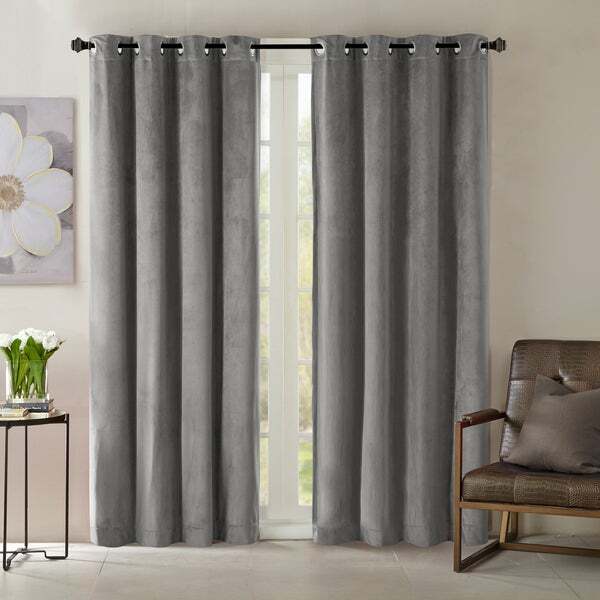 Crafted of durable, machine washable polyester, the curtain features a soft, smooth velvet texture. The curtain is available in ivory, red, grey, navy, or taupe to match your decor, and additional lining blocks harsh sunlight and provides privacy. I wanted something to give us more privacy at night for a set of large, living room windows. We live in a 100+ yo house, with a lot of woodwork so we also wanted to be able to let in as much sunlight as possible and keep the room light. As a solution to keeping a victorian house as light as possible, while staying true to its character, the ivory yvette curtains can not be beat. While the pricepoint is low, they look high quality (yes, I tried to buy cheap velvet curtains before and have been burned). They let in light when I forget to draw them back but also provide plenty of privacy at night. Highly recommend. These are a fantastic, high quality lined curtain at a great value. I always go to Overstock for extra wide and/or extra long curtains and there lined curtains have never disappointed. Highly recommend. These are a really beautiful fabric- soft smooth velvet and feels thick- plus they are lined. I ordered the gray for one room and it is really close to a blackout curtain. I ordered the ivory for another room and it doesn’t block out as much light but gives the room a lighter feel with the light curtains. I plan to order more! Love it. I bought the color ivory, my bedroom furnitures are black but with the ivory curtain, it makes my room brighter. Nice velvet texture, looks expensive. I'm definitely going to order one for my daughters room. It's always dicey buying such items sight unseen, but the quality of these curtains was a fine surprise given the very reasonable price. They drape beautifully, and to me they feel luxurious. I'm very pleased with this purchase. Of course everyone's response to a product is subject to their unique tastes and requirements, but I'm guessing that many shoppers who are looking at curtains at this price point would be pleased with them. These are not complete blackout curtains, but we didn't need that. I'm confident they're going to help keep the room warmer this winter. These curtains are perfect! Beautiful deep red color, heavy weight, with white lining facing out. They keep our home cooler in summer and warmer in winter. I will definitely buy again. I love the texture & it goes so well with my new bedroom decor. I was disappointed that it didn't come as a pair so I ended up ordering a 2nd panel. I would recommend this item, however, buyer beware: order 2 panels. These curtains match my comforter.I bought ivory color.They Hang beautifully.This set gave my bedroom a nice pick me up for winter. Curtains were just as I expected. Very soft and was the color it showed in the picture. I wished it would of been a little more room darkening but overall great! Very Elegant. Unfortunately, I needed 4 navy and they were only able to send 3. I’ve checked multiple times and haven’t been able to get the 4th. These are so very luxurious! I have learned from experience, you can never go wrong with Madison Park! Very good quality. Coverage is better than I pictured. Color is spot on, these are room darkening curtains, they are not complete black out. However they are a very nice curtain! They block out the light are very velvety and soft. Perfect for the bedroom. Yes, these are blackout curtains. "There is only one panel, not a pair??? Strange." The Madison Park Yvette panels are sold as a single panel.